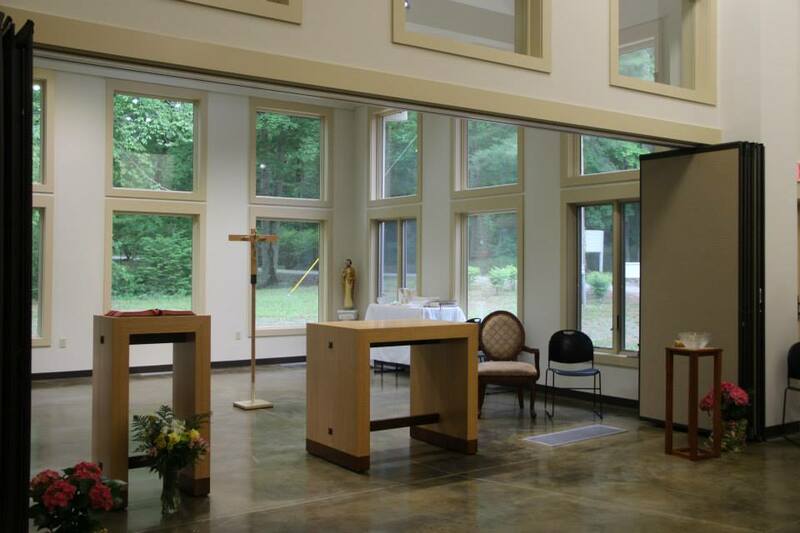 The St. Francis of Assisi Chapel, prior to the Altar dedication. 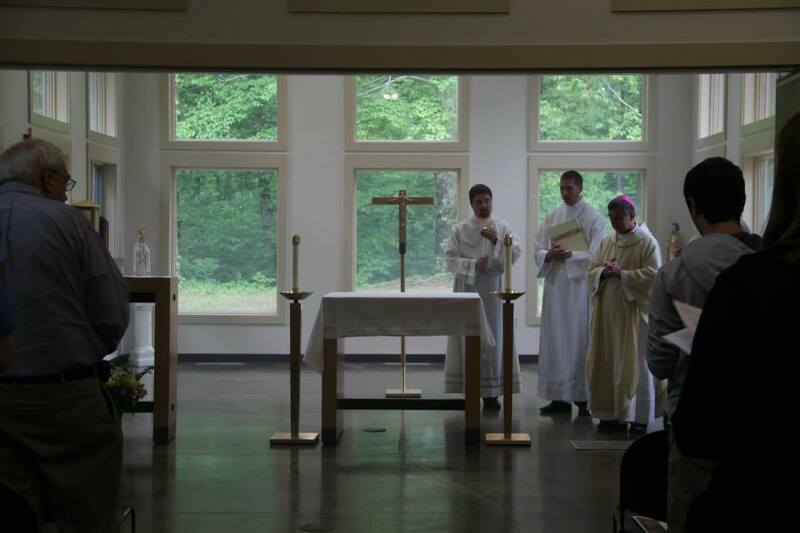 This past week we had the dedication of the new Altar at Gasper River Catholic Youth Camp & Retreat Center in Bowling Green, KY. Gasper has been my “home” and summer job for the past two years. (This final round is #3) It was a great joy and blessing to be able to emcee the dedication and serve alongside my friend Sam Rasp, Deacon Matthew Keyser, and my Bishop. The Liturgy for the dedication of the Altar during Mass is in my opinion one of the most beautiful liturgies. It is one that is steeped in tradition, full of beauty, prayer, and symbolic actions. 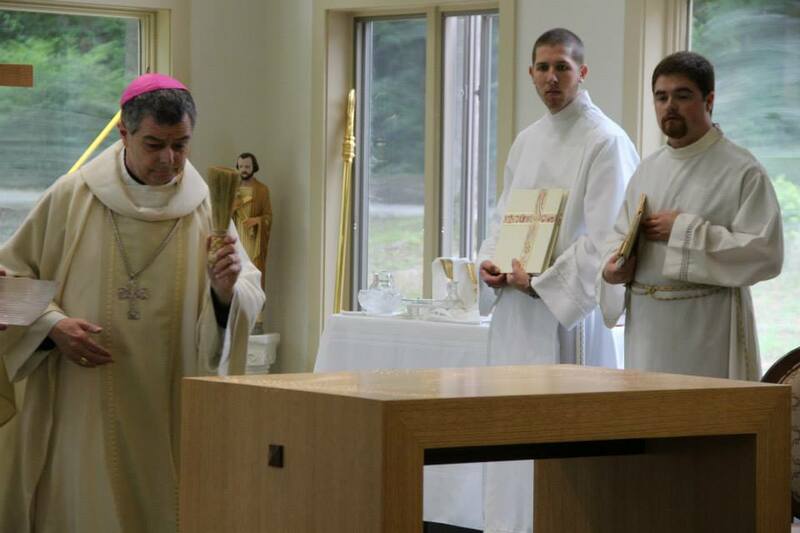 During the Liturgy there are several main actions that are performed. 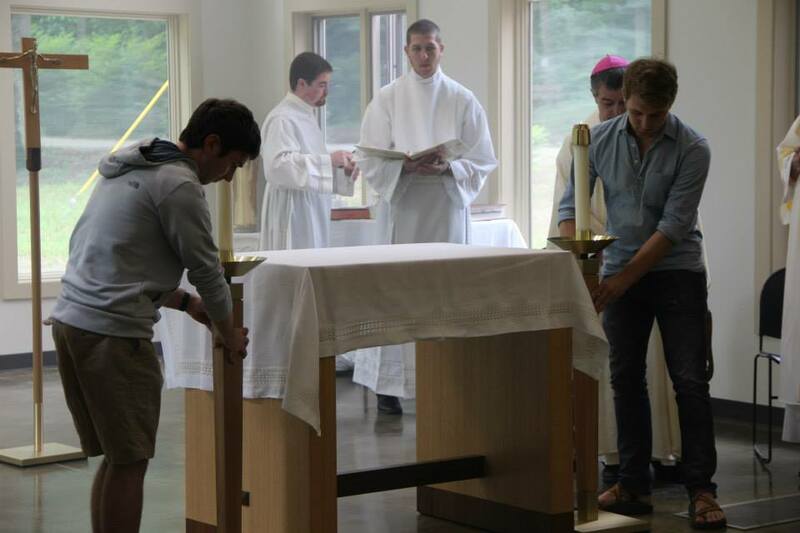 This movement of different actions in the Mass and ritual for the dedication of an Altar is a wonderful way to look at walking the way of beauty. It is a way in which we can encounter God and his Son Jesus, in unique, beautiful, and meaningful ways. LEt’s look at this Ritual a little further and see how Consecrating an Altar works and how it relates to us as a consecrated and chosen people. 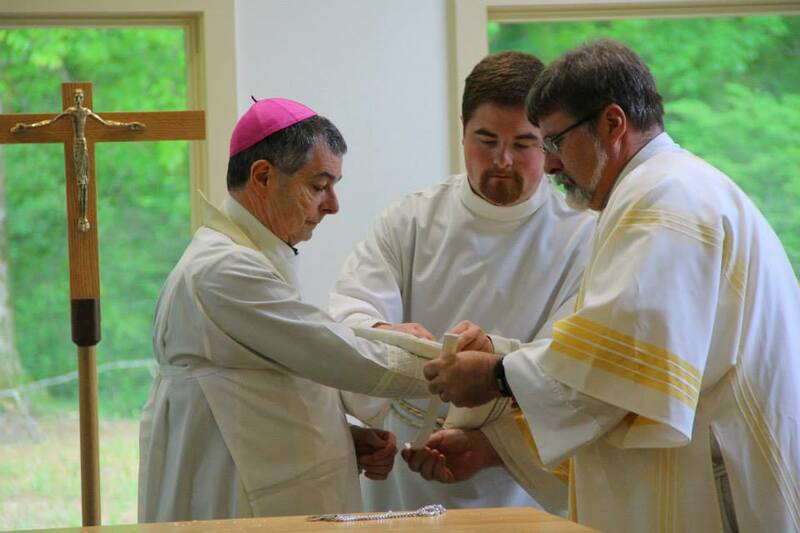 Deacon Matthew and I assist the Bishop in binding his sleeves and placing a gremial on him. the imposition of hands and calling down of the Holy Spirit. His hands are anointed to bring Christ to the world in the Eucharist as he acts in persona Christi through his ministry. 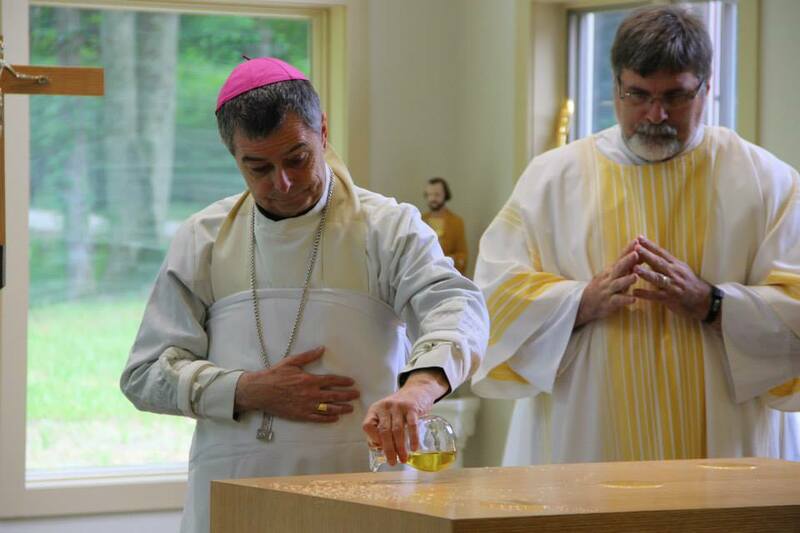 Bishop Medley spreads the Sacred Chrism Oil across the mensa of the Altar. smears the Chrism over the entire surface. His hands are so full of Chrism after the anointing that he normally has to wash his hands several times. You can just smell the Chrism in the air, the silence of all those gathered directing their attention to the ritual at hand. 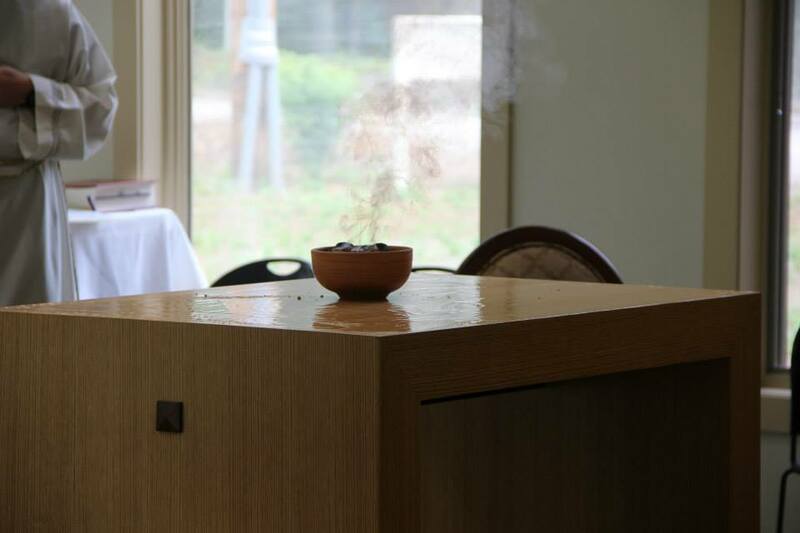 The brazier (bowl) of Incense symbolizes our prayers rising to the Father. Lord, may our prayers ascend as incense in your sight. As this building is filled with fragrance so may your Church fill the world with the fragrance of Christ. 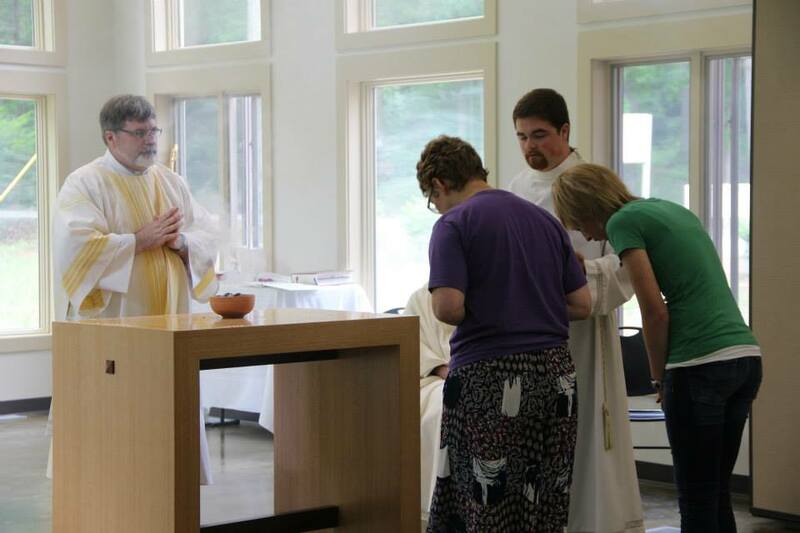 Olivia (left) and Emily (right) bow before the freshly consecrated Altar while Deacon Matthew and I look on. while sitting down, this part symbolizes the women who came to the tomb to anoint the Body of Our Lord and wrap him in white linen. There was no music for his part of the Mass, the silence, and reverence with which the two girls wiped the altar spoke for itself. My sister, Emily and fellow staff member Olivia Conder volunteered to wipe the Altar off. They came forward and reverently bowed to the Altar, showing that it was consecrated. They were the first really to bow to it, as during the other parts of the Liturgy such as the procession, we did not bow, rather just go to our places in the sanctuary. This made me recall that Mary Magdalene was the first to recognize our Lord after his resurrection from the tomb. She went to the Tomb and saw that it was empty, and after mistaking Jesus for the gardner, recognized him as the Lord. For the two girls to have the opportunity and joy of being able to recognize our Lord’s presence in the Altar had to have been a blessing. Emily and Olivia wiped the mensa (top) and sides of the Altar with such care and reverence. I actually teared up after the Bishop reminded us of what it symbolized and as I watched with what care and devotion the two ladies took as they attended to their task. thoroughly wiped off, Sam and I placed the White Linen Altar Cloth on it, vesting it for the Eucharistic Prayer to come. 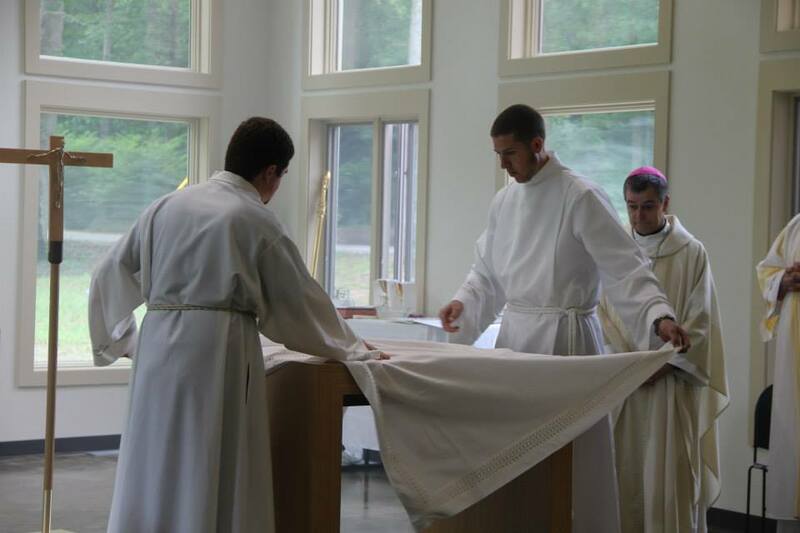 I’m excited for when we will get our new Altar Cloth at camp this summer, so that we do not have to use the simple white tablecloths anymore. so they came a little early and were stuck holding them for a time. The candlesticks probably weigh a good 40 pounds each. I felt sorry for them! Haha! 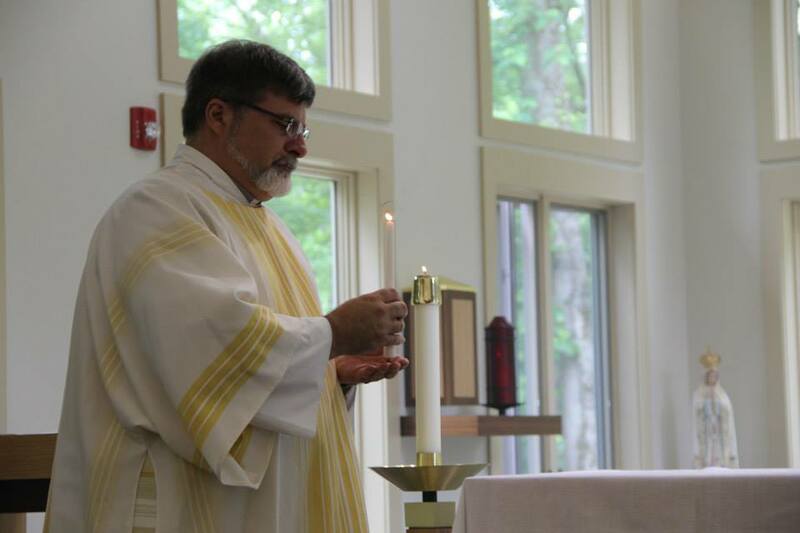 Deacon Matthew lights one of the Altar candles. Christ. This part of the ritual reminds us of the Easter Vigil, with Christ the light of the world coming and setting us free from the darkness of sin, releasing us into the marvelous light of his Father’s kingdom. Bishop Medley reminded all of us present that although this Altar is now consecrated, we must never forget that we too are a consecrated people. 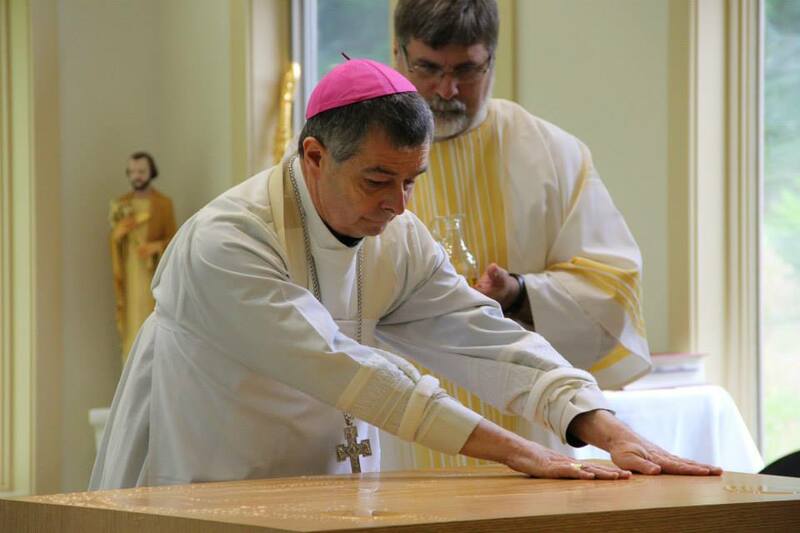 We are consecrated by and anointed with the same Oil of Sacred Chrism used to consecrate the Altar at our Baptism into the family of God, commissioned as we are anointed at our confirmation to go and preach the good news, the priest’s hands are anointed at ordination to make present the Living mysteries of Christ, and the Bishop’s head is anointed at his ordination to receive the fullness of Holy Orders and be able to consecrate others (including Altars) to a sacred purpose. 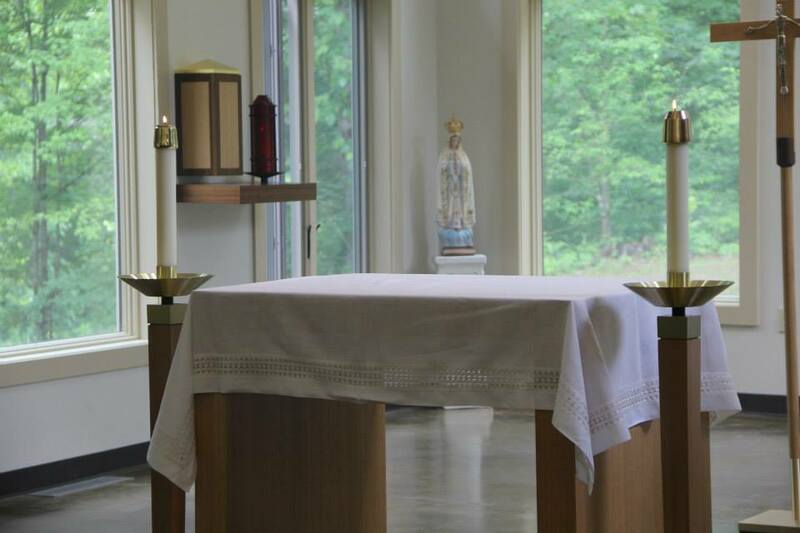 One of the things which I am really excited for about the summer is that we got to keep the towels with which we wiped the Sacred Chrism off of the Altar. I plan on cutting them into a few pieces, so that we have one for each week of camp, and then sharing with the campers that week not only about how we dispose of blessed items (Something I think I’ve done for the past 2 summers), but also about the Altar and how we too are a consecrated people. Our universal vocation is to that of holiness. We are called to offer ourselves on the Altars of our lives to God. Sanctifying our work, asking for our Lord to help us, giving ourselves over to the movement of his Holy Spirit. We must never forget that we are consecrated for a purpose, one which might have a rough road, but in the end will be very rewarding. We are a consecrated people. May we always be ready and willing to answer and act for the task for which we have been consecrated. . . Heaven. Amen. 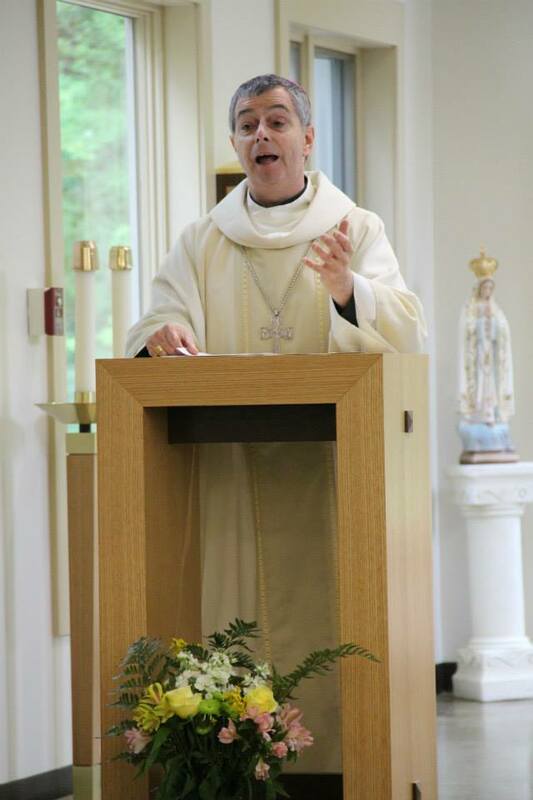 Bishop Medley, preaching during the Mass. The following is the text for the Consecration of an Altar, calling to mind the many Altars throughout human history. How does it help us to see the need to recognize our own consecrated lives? Father, we praise you and give you thanks, for you have established the sacrament of true worship by bringing to perfection in Christ the mystery of the one true altar prefigured in those many altars of old. Noah, the second father of the human race, once the waters fell and the mountains peaked again, built an altar in your name. You, Lord, were appeased by his fragrant offering and your rainbow bore witness to a covenant refounded in love. Abraham, our father in faith, wholeheartedly accepted your word and constructed an altar on which to slay Isaac, his only son. But you, Lord, stayed his hand and provided a ram for his offering. Moses, mediator of the old law, built an altar on which was cast the blood of the lamb: so prefiguring the altar of the cross. All this Christ has fulfilled in the paschal mystery: as priest and victim he freely mounted the tree of the cross and gave himself to you, Father, as the one perfect oblation. In his sacrifice the new covenant is sealed, in his blood sin is engulfed. Lord, we therefore stand before you in prayer. Bless this altar built in the house of the Church, that it may ever be reserved for the sacrifice of Christ, and stand for ever as the Lord’s table, where your people will find nourishment and strength. Make this altar a sign of Christ from whose pierced side flowed blood and water, which ushered in the sacraments of the Church. Make it a table of joy, where the friends of Christ may hasten to cast upon you their burdens and cares and take up their journey restored. Make it a place of communion and peace, so that those who share the body and blood of your Son may be filled with his Spirit and grow in your life of love. Make it a source of unity and friendship, where your people may gather as one to share your spirit of mutual love. Make it the center of our praise and thanksgiving until we arrive at the eternal tabernacle, where, together with Christ, high priest and living altar, we will offer you an everlasting sacrifice of praise. We ask this through our Lord Jesus Christ, your Son, who lives and reigns with you and the Holy Spirit, one God, for ever and ever. R. Amen.